At Apple’s announcement last Wednesday they revealed their new watch series and details for the latest iPhone. There are three new custom chips within their new product lineup, including their first wireless system on chip (SoC). The SoC uses “two high efficiency cores at one-fifth the power consumption of the A9 SoC in the iPhone 6. It also sports a six-core GPU that’s 50% faster than graphics in the A9,” reported EE Times. Apple says that it’s the most powerful chip in a smartphone, but didn’t elaborate on the details of their chip-level work. 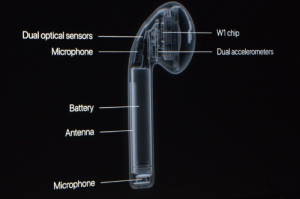 Their new wireless AirPod earbuds and Beats have a custom chip called the W1. The company didn’t explain all the chip functions outside of audio playback and wireless reception. The earbuds have an optical infrared sensor, and offer a five-hour battery life. The new watch has an upgraded chip with better graphics and a significantly faster processor. The new phones have a new image signal processor which can execute up to 100 billion operations in 25 milliseconds—“the supercomputer for photos,” said Phil Schiller, Apple’s VP of Marketing. Read more about the new chips at EE Times.